hydroponics, homegrown, hydroponic gardening, all season chamber. "Full Feature Dual Chamber Cloning Unit"
"The Ultimate Indoor Hydroponic GreenHouse"
"Self-contained Home Hydroponic Gardening System"
"Maximize your 'seed to bloom' indoor gardening." "Organic Yields, Low Power Usage, No Noise, Cost Efficient." 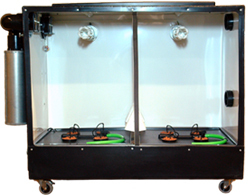 Quickgrow Hydroponics model DC-8 indoor hydroponic gardening system is the 'Ultimate' self contained growing chamber. The benefits of being able to use new CFL technology for both vegetation and flowering, taking hydroponic gardening to a new level with LOW electrical consumption. Indoor growing with our high-tech hydroponics system enable new or experienced gardeners to be 'homegrown' vegetation and flowering specialist's. No need to move your plants, just swap a lamp! Our model DC-8 uses the most advanced compact florescent lighting (CFL), hydroponic equipment and name brand components for ventilation, filtering, watering, ergonomics, timing, and CO2 en-richment, as well as creating aeroponic root environment. The results are being able to grow year round with our state of the art system, that requires minimal space, a little maintenance and little or no indoor growing expertise. By putting your seedling or cuttings into the 10 thru 17 plant positions, 18/6 light cycles using 2- 14000K CFL's to propagate and simply change the 2 bulbs to 2700K and flick a switch to induce flowering 12/12 cycles completing your plant's flowering or blooming cycles. Both sets of lamps work from the same mogul sockets for plant vegetation, flowering and blooming all within a single growing chamber. Sturdy 'FlexForm' designed sealed cabinet. Our 'FlexForm' shell is guaranteed for 5 years**. Quality three inch casters, with brakes, easy to move even when full. Durable water pump, 100 gallons per hour. Hydroton porous rock to support the root system. 10, 12 or 17 mesh pots and all growing mediums. Lined with specular aluminum for maximum reflected light back at plants. Long lasting Elite air pump to oxygenate your water. 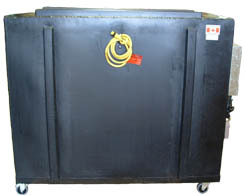 High heat durable plastic reservoir lids and tubs, keeps the water cooler. Reliable digital PLC timer for ease of use, pre-programmed for ease of use. Powerful exhaust fan 4 inch, 105 cubic foot per minute. Remarkable 14000K Compact Florescent (CFL) bulbs for Vegging. Low energy 2700K Compact Florescent (CFL) bulbs for Flowering. Low power consumption, only 2 amps at 120 volt. Very efficient Coco Carbon filter for odor removal. Optional six month Nutrient Package. Optional CO2 injection for growth boost.